ThinkANT 3 in 1 multi charging cable have 3 different charging connectors, that means 1 cable can meet your daily devices charging needs when you are going a long trip , in the office ,in the car or at home, which makes your life more convenient, smart, and colorful, you deserve to own one. (1)These cables only have charge function, can't transfer data. (2)You Can use this cable to charge multiple devices at the same time, but please use 5V/2A -2.4A usb power adapters. (3)These cables don't support Qualcomm Quick Charge 2.0/3.0 ,only provide normal charging speed. 3-in-1 Cable: The up-to-date 3in1 design which charges most of the mobile phones available on market (Charging only, Can't Transfer Data). Universal and Multifunctional: No need to carry any other cables when you are in a car, office or travelling.ThinkANT 3 in 1 Cable is all in one portable charging solution for those who are on move all the time. You Can use this cable to charge multiple devices at the same time, please use 5V/2A -2.4A usb power adapters. The Environmental TPE Material of The Cable is Very Soft and Tangle-free. 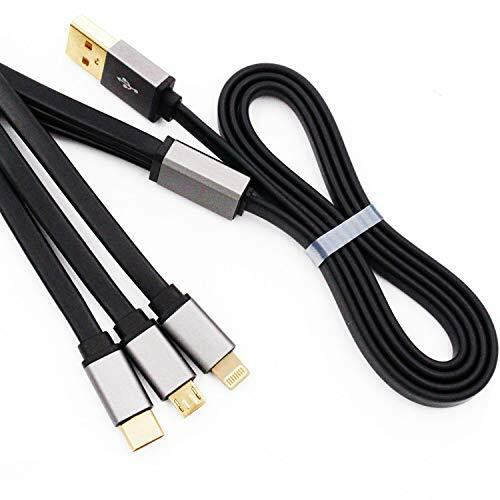 The Gold-plated Connector and Aluminum Alloy Casing Make the Cable More Durable and Elegant. What you will get: 2pack 4FT multi cable charger,30-day full money back guarantee and 24 x 7 friendly customer service. If you have any questions about this product by ThinkANT, contact us by completing and submitting the form below. If you are looking for a specif part number, please include it with your message.